Westbrook High School freshman Zainab Almatwari was this year's recipient of the Telling Room's founders prize for her poem "The Transform Plate Between L.A. and Sacramento," which has been published in the writing organization's annual anthology. WESTBROOK — People who know Zainab Almatwari agree on one thing – she’s going to change the world. This is the consensus among the teachers, administrators and nonprofit leaders who have worked with the Westbrook High School freshman over the past year. Since moving to the U.S. from Iraq in March 2016, the 14-year-old has made quite an impression. Almatwari has also captured the attention of the Telling Room, a nonprofit writing center in Portland. She was this year’s recipient of the organization’s founders prize. Almatwari was notified of her win in May one week before the Telling Room’s annual Big Night event, where she was presented with the award and $500. She was one of 12 students nominated by the organization and was then selected as the winner by the three founders of the Telling Room. According to Sonya Tomlinson, the Telling Room’s multilingual programs director, Almatwari is one of the youngest winners of the founders prize. She described the young writer as “diligent” and “incredibly prolific,” and said she won because of her unique writing style. Almatwari’s poem, which is written in eight stanzas each with their own title, is about her journey from Iraq to the U.S. and how it transformed her as a person. She said she’s grateful the Telling Room has given her the space to share her story. Almatwari got involved with the Telling Room only a few months after moving to Maine when the organization was doing short programs at Westbrook High School. Now, because of the city’s growing new Mainer population, the organization is getting more deeply involved. Tomlinson said the Telling Room will be expanding its programs for Westbrook students in the next school year and will open its annual Young Writers and Leaders program to WHS students. The program, which currently serves Portland and South Portland students, is a year-long program that works with immigrant students to write and publish their personal narratives. The program, which has a competitive application process, will be able to serve 45 students across the three cities next year. WHS Principal Kelli Deveaux said she’s happy students will have this chance. Fernald agreed and said ESL students need a platform to express themselves. After the February vacation camp, Almatwari and several other students read their stories to the entire WHS student body at an assembly. Tomlinson said this is the first time Telling Room students have presented to their peers. Fernald said ESL students are always looking for public speaking opportunities because it helps them practice their English. Almatwari said it has helped with her language skills, as well as with her confidence. Fernald said sharing stories also helps bring people together and understand each other better. Almatwari, who plans to continue participating in Telling Room programs, wants to keep sharing her stories with others. She dreams of one day writing a book and possibly opening a publishing center. She said it’s important that people know the value of their experiences and stories. 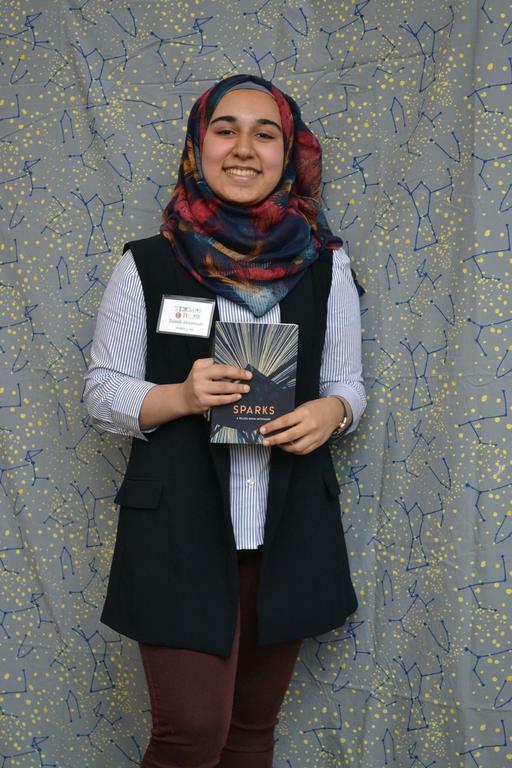 Westbrook High School freshman Zainab Almatwari was this year’s recipient of the Telling Room’s founders prize for her poem “The Transform Plate Between L.A. and Sacramento,” which has been published in the writing organization’s annual anthology.